My husband and I have a love affair with the beach and the ocean. Handy that we live in Florida so close to the beach. Our first date was at the beach, our first kiss, our first I love you, and our wedding were all at the beach as well. Nicholas' nursery is done in a ocean theme with dolphins and fish and other sea creatures adorning the walls and a dolphin themed crib set. Nice. Here in the area we have a little marine aquarium called the Gulfarium. It claims to be the oldest marine aquarium thingy in the U.S. having opened to the public in the 50's. It's very small only a few exhibits, you can do the whole park in about two hours. They have dolphins, and a few sea lions and some seals and some salt water fish exhibits... you get the idea. They only have three shows, the main one being the dolphin show. Anyway we took Nicholas over the weekend because we needed a little family outting to try and reconnect with each other and Nicholas seemed old enough to enjoy looking at the animals. HE LOVED IT! :) He especially liked the large salt water aquarium exhibit that they used to do dive demo's in when I was little but I guess they've stopped that now. These days you just go in and look at the living sea thing which is a large reef. He watched the fish and there was one type in particular that would go zooming by the glass and he was in baby heaven. The dolphins swimming by little viewing holes in their dolphin tank were also a big hit. I really want to take him to sea world now so that he can really look at the dolphins instead of trying to see them through small little windows. The sea lions were also a favorite because their tank he was able to see into and see them swimming. They come right up to the glass and look at you while you're looking at them. It's not a high budget operation by any means but the animals appear to be well cared for and happy so I didn't mind going there so much. They also weren't forced to preform really the shows they did were all educational the animals did almost no tricks. Just a couple of jumps here and there. Aside from that awkwardness of seeing the O.B. between shows I also got odd looks and stares because I was wearing Nicholas in one of my new slings. Ok, so the sling isn't new exactly. I've had it about two months and when I first got it I hated it. Not long ago I offered to sell it to a friend of mine who is at this very moment in labor and delivery having her baby today. Something inside me told me to try the sling out one last time to make sure that I didn't like and what do you know. It's now my favorite, plus it's red which is one of my favorite colors :). It's easier to wear than the other one because it's so much shorter and I don't have to wrap the tail around the rings to avoid tripping over it. It's also a cooler fabric so the humid weather didn't bother us until it rained. Nice. 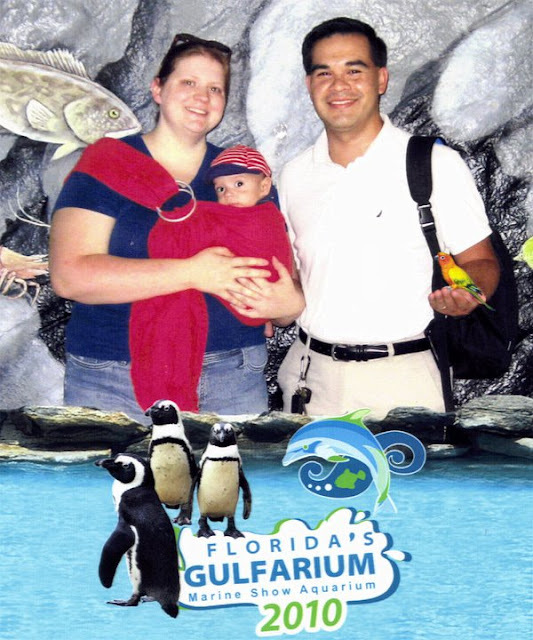 Apparently the type of people who take their kids to the Gulfarium aren't the kind of people who have ever seen a ring sling. Oh well. He enjoyed it and it kept him high enough to see everything without killing my arms for the first half of our time there. One lady though kept starring and making ugly faces like how dare I have my baby in that thing. I wanted to smack her upside the head. We rounded out our little family adventure with a photo taken by the parks photographer. Kind of cute.All in all it was a good day. Going to be taking the photos and putting together a little slide show of the day's events whenever I get a spare moment... wish me luck with that lol!